Nobel-winning Turkish author Orhan Pamuk during a news conference before the opening of the Museum of Innocence in Istanbul April 27, 2012. Cataloging Turkey's history during the turbulent times of the 1960s and 1970s, and paralleling a recent book by Turkey's Nobel laureate, Orhan Pamuk, Istanbul's Museum of Innocence opened this week. Pamuk said his Museum of Innocence is unique - dedicated to the fictional lives and times of his characters, Kemal and Fusun, from his similarly named novel. "We try [to] recapture the atmosphere of the novel, combined with the melancholy Istanbul of the '60s and '70s, and try to produce a space of nostalgia and strangeness, all embedded in real and ordinary life objects," he said. Nearly two decades in the making, the museum, housed in a 19th-century house, consists of 83 displays paralleling the book's 83 chapters. As in his novel, in which Pamuk appears as a protagonist, much of the material on display belongs to the writer. "I used my personal photos and objects disguised as being my protagonist's things. They are not easily identifiable, so the Museum of Innocence - just like the novel - is about the line between fiction and reality. The whole art of novel is about readers asking to themselves did the author really live this or did he imagine this? More or less, I did the same thing with the museum." 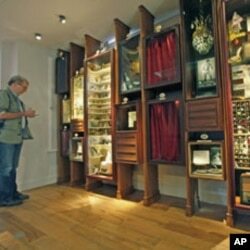 A journalist inspects artifacts from an exhibit at the Museum of Innocence in Istanbul, Turkey, April 27, 2012. The eclectic museum appears to be a hit among visitors. "It's so beautiful. It's the reflection of Pamuk's internal life, and emotional life, as well as the characters written in the book. And the other thing, it's so unique," said one visitor to the museum. Pamuk's rise to international literary success is built on his ability to portray, through his characters, Istanbul's melancholy - a former imperial capital that has fallen on hard times. But the location of the museum tells a new story - that of the transformation of Istanbul. When Pamuk bought the building 15 years ago, the area was dilapidated and poor. Today it is fast becoming the most trendy part of city, with its art galleries and matching high-priced real estate. "The first Turkish readers, the new generation," said Pamuk, "my Istanbul is much more fun. It is not sad and melancholy. I agree with them. But don't be misled by the happy 1 million in the center of town, and looking at the Bosporus. Istanbul is 13 million. There are hundreds of thousands of jobless in the periphery of town who are still poor." Politics in Turkey also has changed since the era depicted in the museum. Much of the time it was under the shadow of military rule. One of the protagonists in Pamuk's Museum of Innocence is tortured and spends years in jail. Today it is the military generals who are on trial for past coups and alleged coup plots. Pamuk himself was a target of the alleged plotters, who prosecutors claim wanted to assassinate him for his outspoken liberal views. When asked if he is optimistic about Turkey's future, he remains guarded. "I [am] happy that those soldiers, who prepared all those military coups, who tortured and disrespected intellectuals and people of this country, are at least being investigated. It has to be done for an open liberal democratic society. But at the same time, I am sad and pessimistic about so many journalists in jail," said Pamuk. According to human rights groups, more than 100 journalists are in jail in Turkey. The government disputes the numbers. But for Pamuk, observers say, the new Turkey is treating him well. The Nobel prize winner is no longer making headlines for being persecuted by the government, but rather for his success. His museum already is being heralded in the Turkish media as another important achievement.